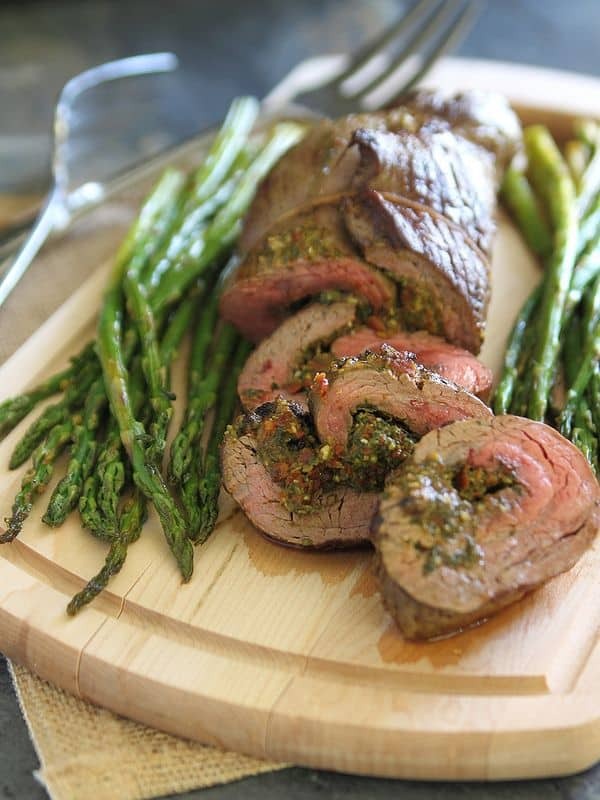 This pesto stuffed flank steak is an easy and quick dinner that looks fancy. For as much as I would absolutely love living in NYC, having a coffee shop within walking distance and shopping at small markets instead of the massive suburban grocery stores, there’s something pretty cool about seeing a sign at the end of the gravel driveway on your way home from running errands that says “100% Grass Fed Meat” and an arrow welcoming you down the drive. So we pulled in and crunched our way down the bumpy gravel driveway until we were clearly parked in front of someone’s farm house with a little shed-like building in front of us and a whiteboard affixed to the outside with the day’s cuts and prices. We jumped out of the truck, were greeted by the friendly farm mutt and walked in. As we looked over the selection, the father/son duo that was outside on their front porch just seconds ago, walked in, threw on their white butcher coats and hair caps and told us all about the farm, the cattle and how this was their first day open to the public. They suggested a few options for us and after some friendly chit chat we turned to leave and get back in the truck. Right before we opened the door, he said “wait! do you have a dog?” I said yes and that’s when he offered us a marrow bone for her. If I wasn’t already sold by the looks and price (so cheap for grass fed!) of the meat, I was right at that moment. We took the bone home for Ginger who has been happily prancing around outside with it in her mouth for the past 48 hours and we enjoyed the steak as an early Sunday dinner before saying goodbye again for the week. It was tender and deliciously bright with the lemony sun-dried tomato pesto stuffing. And for that, I’m thankful I live where I do. Combine all pesto ingredients except olive oil in a food processor and process until finely chopped, scraping down sides if needed. Drizzle olive oil in while food processor is running until pesto-like consistency forms. Set aside. Lay flank steak on cutting board. Cover with plastic wrap and pound with meat tenderizer until it's evenly about 1/4 inch thick. Season steak with salt & pepper. Spread pesto with a spatula evenly over the entire steak, leaving about 1/2 inch uncovered around the edges. 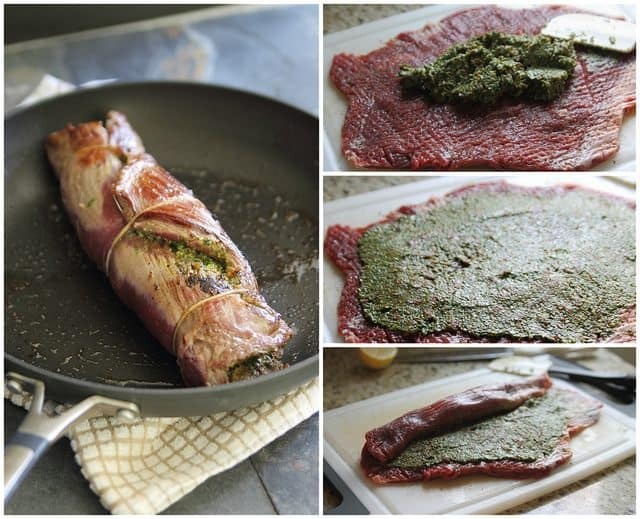 Roll steak up with the grain and tie tightly with kitchen twine in 3 spots so pesto stays inside while cooking. Heat a skillet with the tablespoon of olive oil over medium-high heat. Once hot, brown the rolled up steak for about 2 minutes on each side. Transfer skillet to the oven and bake for about 25 minutes for medium. Remove steak from the skillet, transfer to a cutting board and let rest for about 5 minutes before slicing. as weird as it sounds this reminds me of my mom. Was an easy dinner, but not cheap! Location of said place to get grass fed beef? Are you local? If so, it’s off of Stringham Road in Lagrange. I was wondering the same thing. I’m in Poughkeepsie and have been wondering where we could find local meat. Thank you! OMG! Gina if this tastes as good as it looks… I swear I’ll die! Such a creative recipe, LOVE IT! so jealous of your cheap, grass fed meat!!! that’s how it should be! i barely eat meat now, maybe twice a month because i hate buying the crap ones at grocery stores and i also hate paying so much for the good kind. 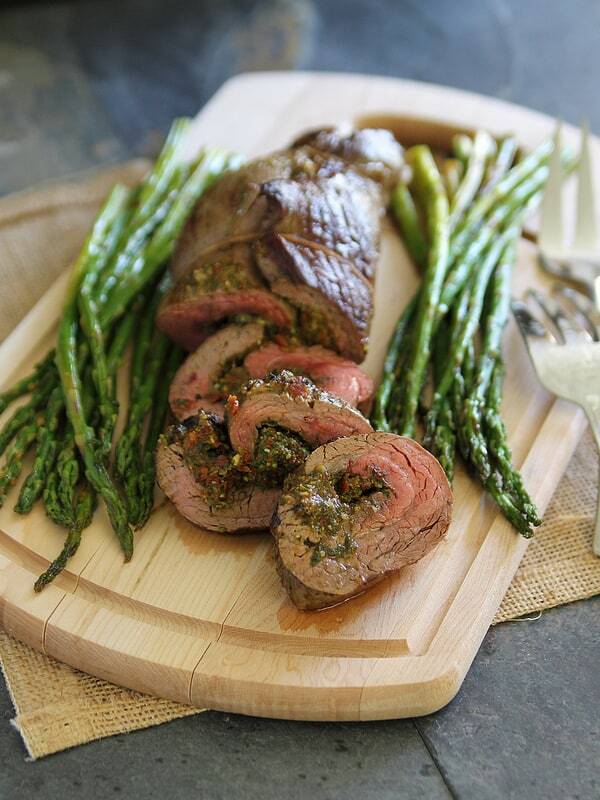 Flank steak is my favorite cut and you’ve made it look absolutely mouthwatering with this recipe, Gina! Such a great idea to stuff it full of sun-dried tomato pesto. Thanks for sharing! This looks sooo amazing and that sounds like my kinda farmer!! Stories like that actually warm my heart and I tell everyone I know about those experiences since they are priceless and you don’t get that buying your meat at the grocery store! We had a great farmer in NY (Buffalo area) before we moved. I absolutely adored him. I haven’t found that yet out here in California, which means I haven’t eaten much meat, but I am sure our guy exists somewhere out here. I hope you find your guy soon :) It really is heart-warming. I’m already excited to go back this weekend. I LOVE that there is spinach in your pesto! This looks amazing, Gina! This is such a gorgeous recipe!! That is an 11/10 gorgeous Gina. Beautiful recipe. Makes my mouth water and I gave up beef a few years ago. I like the presentation with the asparagus. I made this for my family, and it was delicious! The timing for cooking was perfect. If I made it again, I would double the dried tomatoes and half the lemon juice; as it was, the lemon juice over powered the other flavors in the pesto. 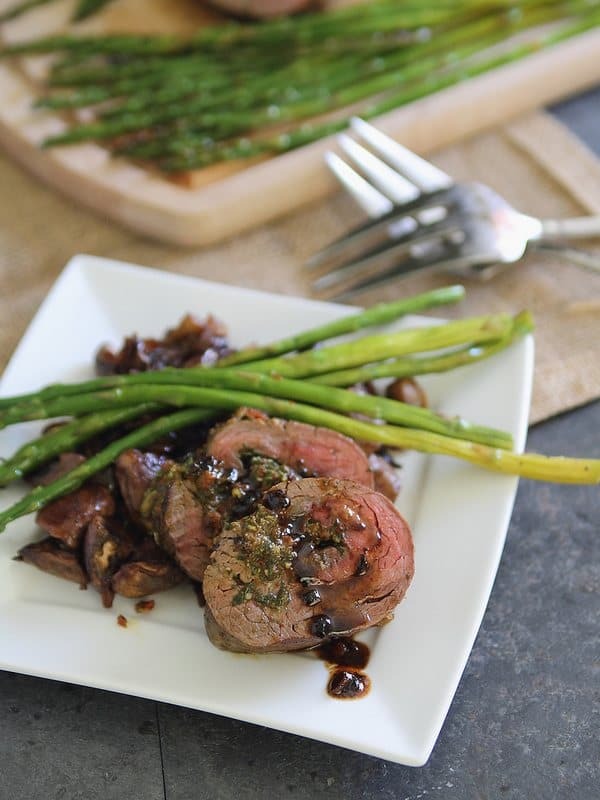 As a final note, if some of your pesto spills out when you roll your steak, as mine did, collect it and spread it on the top of the steak before you throw it in the oven, after browning it. I cannot wait to try this – I know I am going to love it! I’m making this tonight and right now the whole house smells so delicious….my mouth is watering. Thank you for the recipe. Hey this looks delicious!!!! I am definitely making this for my next dinner party!!! Just wondering if you served it with anything and if it could be served with a sauce, jus or reduction of some kind? If you had any suggestions because I’m not sure. If you mean side dishes, asparagus and potatoes are a usual appearance. For sauce, I just used the juice from the pan. A balsamic reduction would be great though! Beautiful recipe, I can’t wait to make it! Would you recommend a certain potato recipe to pair with it?